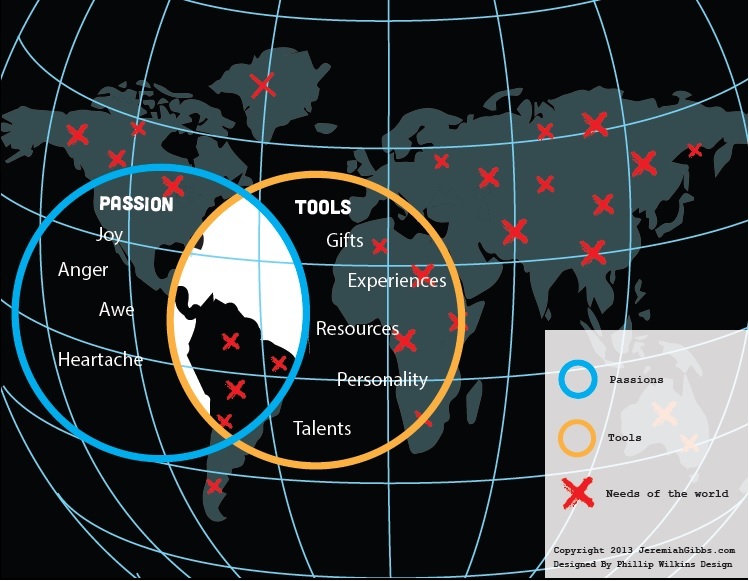 To learn how tools are integrated into the entire notion of call, click the map. So far in this series I’ve said a lot about the passions that are a person’s internal motivations, animated by the Holy Spirit, to pursue a calling on their lives. But passion for something will not get you far if you don’t have the tools to do anything about it. The second major component to pay attention to in discerning God’s calling is your personal toolbox. I use this name to simply indicate that all of us have a unique set of tools that we can use to minister to the world. We often hear pastors and mentors suggest that we have a gift that God has given us to minister. Usually they mean prophecy, healing, wisdom, leadership, or one of the other spiritual gifts named in Scripture. As we will see, those are only a part (an important part!) of our calling toolbox. I call this a toolbox because I like to refer back to a metaphor: if you are a plumber that has a toolbox full of hammers and crowbars, what are you going to be able to do to fix a broken pipe? Not very much. If you want to be a plumber you have to have the right tools and know how to use them appropriately. So it is with God’s mission. God’s mission is big and broad and in need of workers. There are lots of things to be done. But they don’t all require the same tool set. So we must discern which aspects of God’s mission that we have tools that we can offer to help advance the mission. Over and over again I hear people use Moses as an example of someone that God called in spite of his lack of ability, because he was supposedly slow of speech. But actually Moses had a very unique set of gifts that enabled him to fulfill this call of God. I would suggest that all of them were discernible by him if he had paid attention. I’ll use Moses as an example later in this series to explain how God uniquely equipped him for the ministry to which God had called him. When Moses begins to object to his ability to do what God is calling him to do, God asks him a simple question: “What is that in your hand?” This staff that Moses carried day in and day out was something he had grown accustomed to. I suppose it isn’t unlike my iPhone. I don’t think much about it because it is something I carry every day to do really mundane tasks like calendaring, paying bills, and even (sometimes) making phone calls. But this iPhone has also been my pastoral care lifeline when students are experiencing tragedy and is my constant connection with my wife- both very holy things to me. Moses staff was similar. He had stopped thinking about it. Now God showed him a new way to use that tool to do the good work that God had called him to. The tools that I will introduce in the next several posts in this series are like that. Many of these things are so familiar to us that we have stopped thinking of them as unique tools for which we can work for the Kingdom. Here is a quick list of the tools that I will pay particular attention to in later posts. Spiritual Gifts/Natural Talents: I’ll explain the difference between these two. Most important is that both of these are the things that you are good at doing. Personality: God has made you with a unique way of interacting with the world. This aspect is central to secular career exploration and is often ignored in spiritual discernment. Resources: Your money, intelligence, personal and professional networks, and many other resources help to open doors that would not otherwise be open. Discernment Exercise: Consider who knows you really well. Schedule to have a conversation with someone that can tell you about some of these tools that they have seen in you. Take the list above, or even better, send them this post in advance of meeting. Ask them what they have noticed about your tools and be sure to add them to the inventory that you started here. Judging after these lovely and excellent article. My thoughts starts, and maybe, I’d love to teach hymnology in India, Nepal or China.